SNAP for WordPress Version 3.3.6 has been released. This version adds support for the API 2.0 from Facebook. Facebook silently changed it’s policy regarding app permissions that available without review and approval. It means that if your app existed before April 30th 2014 plugin will use the same API 1.0 that worked fine for the last 4 years. If your app created on or after April 30th 2014 it will only be compatible with Facebook API 2.0 that requires a complicated review/approval process. SNAP for WordPress Version 3.3.0 has been released. This version adds support for Flipboard Magazines (Pro Only) and a lot of improvements. One important improvement is rewritten Facebook API access. When we started this project as “Facebook-Twitter-Google+ Autoposter” we took official Facebook PHP API library and used it. Two years and 21 networks after that we actually asked a question why exactly we are still using those 47kbs of code. We can do much better then that. We have enough knowledge and experience to use Facebook API directly, without some “middle man”. As a result we got much faster and more reliable Facebook autoposter engine. Another important change is disabling Auto-Reposter if WP Cron service is not correctly configured. This should save a lot of frustration and prevent many issues. * New – New network “Flipboard”. Post your links to your magazine. * Improvement – A lot of code, error handling and interface optimizations and improvements. * Improvement – Plugin is not using 47kb of official Facebook API for PHP anymore. Facabook autoposting is now more stable and faster. * Improvement – Auto-Reposting functionality will be disabled if WP Cron is not configured correctly. * Improvement – Plugin shows how many posts is included in auto-reposting on the settings page. * Bug Fix – Many bug fixes and improvements to the “Auto-Reposting” and “Posts from Query” functionality. * Bug Fix – Checkboxes with selected categories were not saving correctly. * Bug Fix – Google+ – custom URL postings were incorrect. 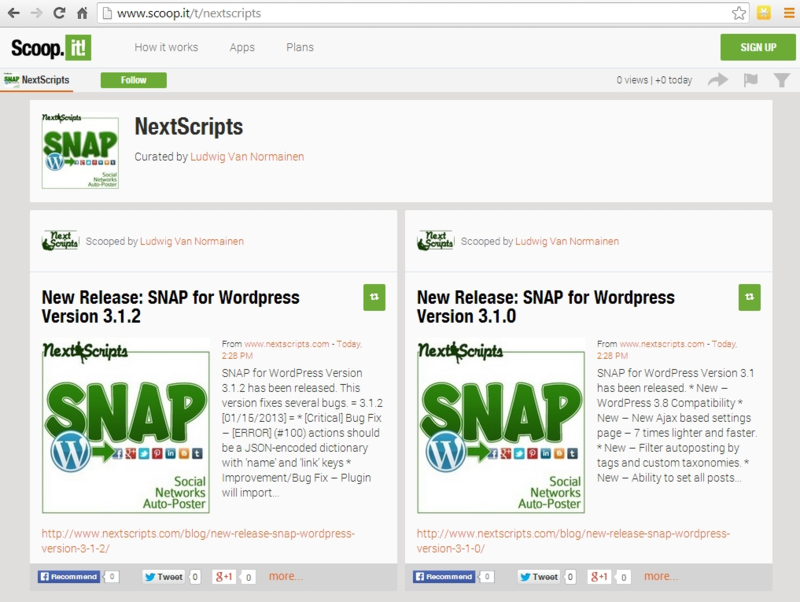 SNAP for WordPress Version 3.2.0 has been released. 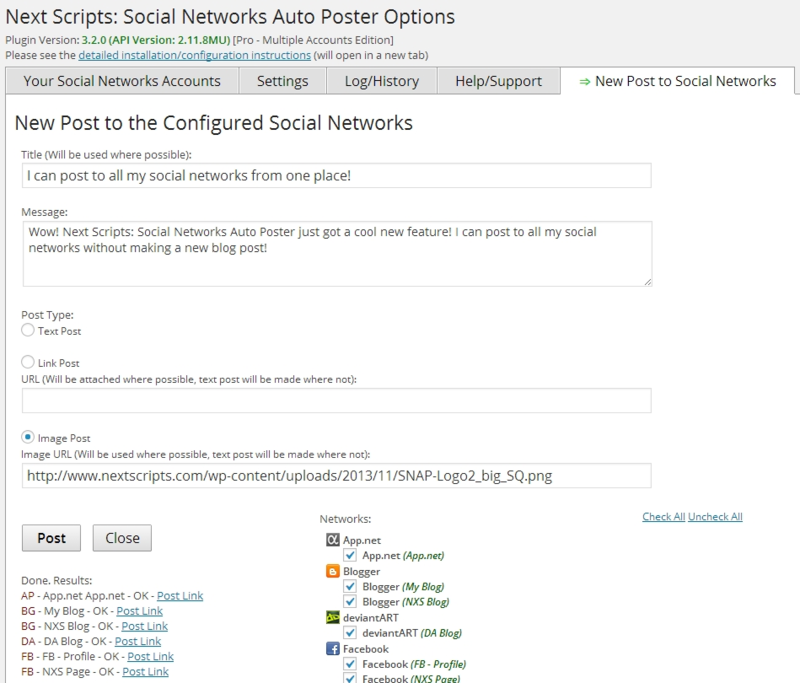 This version adds an ability to make posts to social networks without making a new blogpost and adds Scoop.It to the list of supported networks. * New – Post to social networks without creating WordPress post. * New – New network “Scoop.It”. Make text posts, link posts, or image posts. Post with tags. * Improvement/Bug Fix – New interface for checkboxes for networks with excluded categories. * Improvement/Bug Fix – %EXCERPT% tags won’t cut the actual excerpt to 300 characters anymore. * Bug Fix – filed link [Enabled/Disabled for Repost according to Categories/Tags/Taxonomies filters] * Bug Fix – Stability improvements to re-posting functionality. SNAP for WordPress Version 3.1.2 has been released. This version fixes several bugs. * Improvement/Bug Fix – Plugin will import all comments from Facebook posts, not just the first 100. * Bug Fix – Plugin were re-posting the same “Sticky” post in some configurations. SNAP for WordPress Version 3.1.1 has been released. This version brings compliance with “Jan 14 Twitter API changes” as well as some bug fixes and stability/compatibility improvements. * Improvement/Bug Fix – Stability improvements and better error handling for WordPress based sites. * Improvement/Bug Fix – Some fixes, improvements and optimizations to the re-posting functionality. * Improvement/Bug Fix – More clear interface for category filters. * Bug Fix – Duplicate categories filter for Twitter has been removed. * Bug Fix – vBulletin module optimization and better error handling. * Bug Fix – General options were getting overwritten by post options in some configurations. * Bug Fix – Memory limit problem for servers with more then 1GB of allowed for PHP memory. The long awaited version 3 has been released. * New – Major release with a lot of new and improved features. * New – Auto-repost existing and already posted posts based on some rules – one-by-one from old to new, one-by-one from new to old, from specific dates, “older then N days and younger then X days”. * New – Reset all Settings for existing posts. * New – Extended debug info. * New – Ability to send errors by email. * New – New Option – How to handle spaces in hashtags. * Improvement – Comments import has been completely redone. Disqus and usernames should be correct now. We have reached the point where we can offer SNAP Version 3 Beta to anyone. Product is already stable enough not to cause any major troubles. There will be no more new feature added, just some more bugfixes and then it will be released as “stable”. First of all, thanks to all people who tested betas 1 – 6 and RC1 and provided us with valuable feedback. We made a lot of bug fixes and made some functionality changes based on your suggestions. Now, you can take V3 Release Candidate 2 for testing. Please go to the SNAP V3 Beta download page. – Auto-repost existing and already posted posts based on some rules – one-by-one from old to new, one-by-one from new to old, from specific dates, “older then N days and younger then X days”. – Auto-repost existing random posts from from specific dates or “older then N days and younger then X days”. The new version 2.7.18 has been released. It contains several improvements and fixes for recent changes in various social networks. Comments import issues and additional URL parameters issues has been fixed as well. This will be the last 2.X.X release. Version 3 is almost ready. Full list of changes since 2.7.14. While most of the plugin were written using new V1.1 Twitter API, one function were still partially dependent on old V1 API functionality. Twitter V1 API is now officially retired, so SNAP has stopped working for some people who were using that function. We just released SNAP version 2.7.15. This version has all Twitter code updated to the latest V1.1 Twitter API and all functionality is working again as it suppose to. Please upgrade your plugin to this version. You can set a specific time when the post will go to the configured social network. This feature expands the existing “delayed postings” functionality. This is actually two features in one. 1. You can use it to import all your existing posts one by one on specific schedule. 2. You can use it to recycle your old posts by reposting them (randomly or one by one) to your social accounts. This will be useful if you import RSS or other feeds to your site. Your posts are imported all at once, but will go social networks one by one with specified intervals. You can select what image to use for autoposting if your post has several. App.net, Reddit and deviantart.com will be added. Version 3 will be released once we finish beta testing and work out all bugs. The new version 2.7.14 has been released. It contains some improvements like support for Categories for Google+ Community Pages, Facebook Secret Groups, many bugfixes and new security model. This version adds an ability to skip the check for user privileges as well as an ability to allow users to autopost without seeing to changing any options. This change makes a possibility to resolve the issues caused by previous security fix. Note: This is upcoming version 3 functionality. It’s not available in the current 2.x.x version. New field on “New Post”/”Edit Post” page – “Image(s) to use”. Default is “Auto” which make plugin select image automatically. 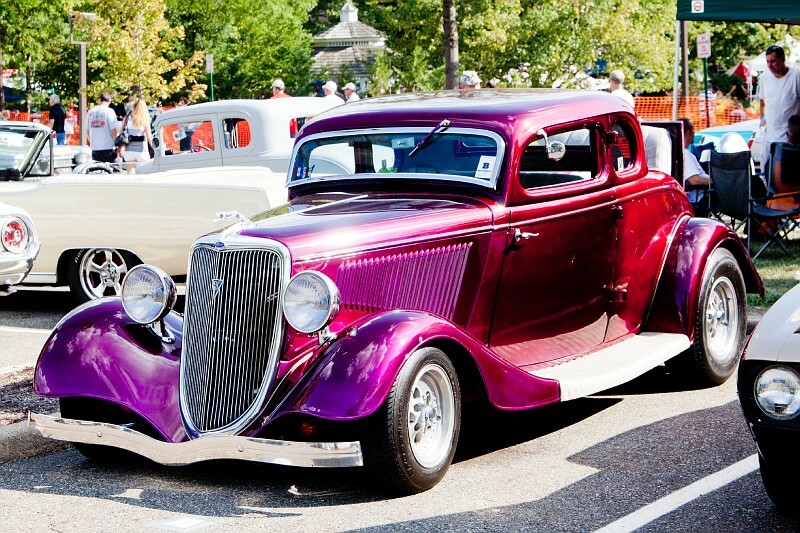 Plugin will take featured image from the post. If there is no featured image it will take the first image from the post body. If your post body has no images it will take the specified default image. Uncheck “Auto” and plugin will show the grid of images from your current post. You can select the image that will be autoposted to your account. Twitter: “Status contains malware” problem. [March 30, 2013] UPD: This issue has been resolved. Twitter is no longer blocking gd.is links. The new version 2.7.4 has been released. It contain very important fix resolving the “Duplicate Posts” problem. Please install this upgrade if you are getting duplicates or if you missing some posts. 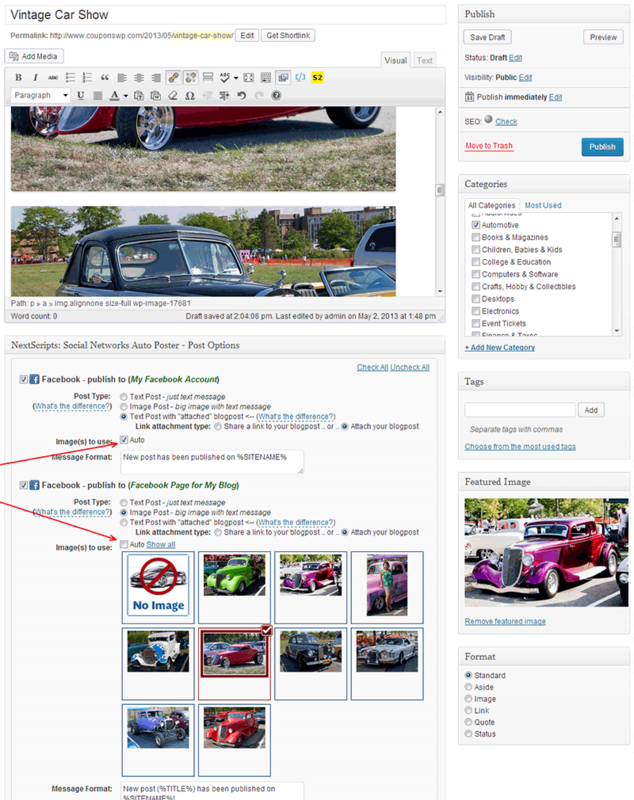 Release also adds support for use of featured images from Yet Another Photoblog (YAPB) plugin. Several other bugs have been fixed as well. * New – Support for images from Yet Another Photoblog(YAPB) Plugin. * Improvement – Pinterest will recognize entered price. * Bug Fix – Duplicate posts issue. * Bug Fix – Broken VK Image posts. * Improvement/Bug Fix – Better Duplicate handling.